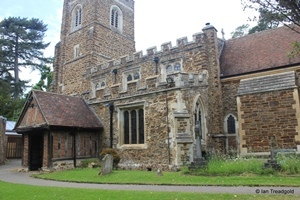 The church of St Peter and St Paul in Flitwick is on the southern edge of Flitwick on the quiet cul-de-sac of Church Road. Parking is available outside the church. The church is built of ironstone and consists of a nave and chancel, north and south aisles, north vestry and south porch with a west tower which leads to a modern chapter house to the south west of the church. The chancel is around 30 feet by 16 with the nave adding a further 32 feet by 20. The aisles add about 8 feet to the width and the tower is around 12 feet square and some 60 feet high. 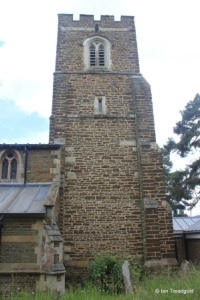 With origins in C12, the church was enlarged in C14 with the south aisle being added along with the tower. The nave clerestory and the porch were added late in C15 or early C16. Much restoration took place in the mid C19 with the addition of a north aisle and rebuilding of the north wall of the nave. The Norman north door was resited at this time. 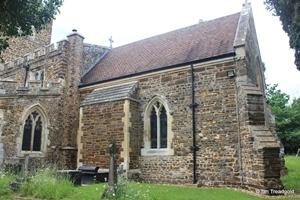 The vestry was built at this time and later extended in early C20. More recently the chapter house was built in 1983. 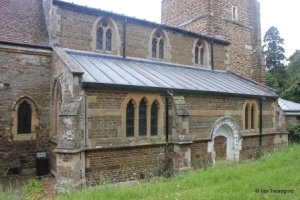 The south aisle has windows to the east and west and two windows surrounding the porch. 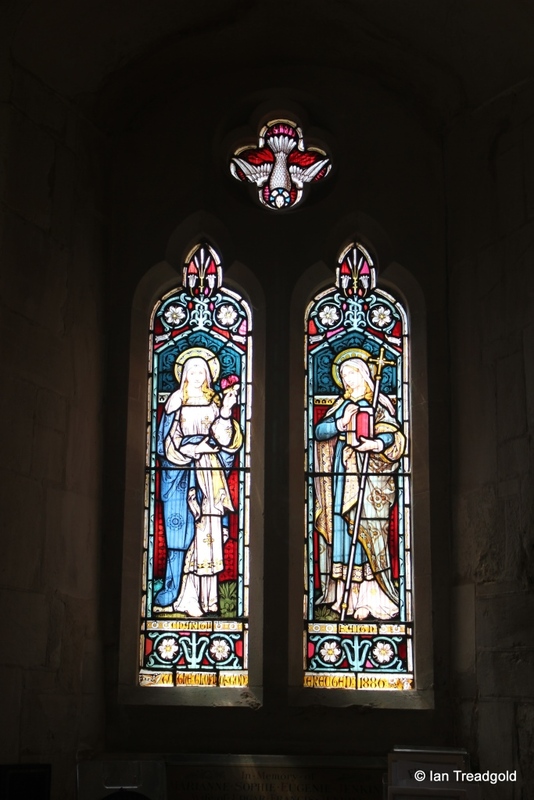 The east window of the aisle dates, like most of the windows from the Victorian restorations. It has two tall cinquefoiled lights with a quatrefoil design above under a pointed arch. The glass in the window dates from 1900 and depicts Christ as the Sower and Shepherd. 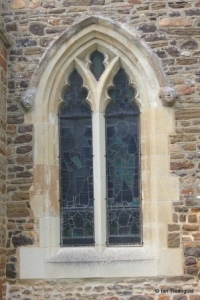 Fragments of medieval glass have been incorporated in the upper parts of the window. 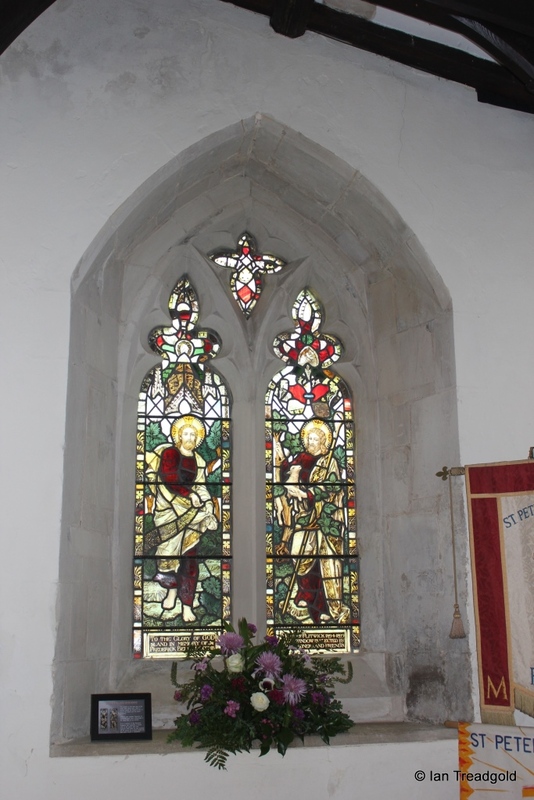 The window was erected in memory of Frederick Bell Lipscomb the vicar from 1894 to his death in 1899. 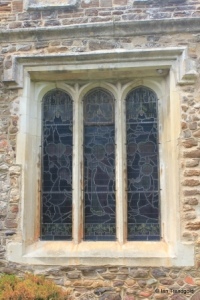 The main south facing window is of three uncusped lights under a square head. 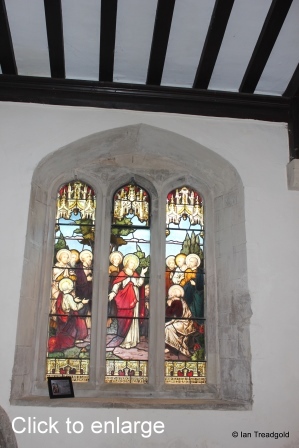 The glass in this window was added in 1897 and depicts Christ preaching to the Apostles. 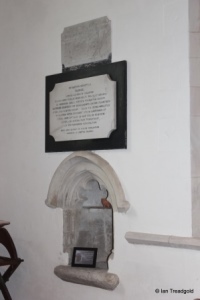 It was erected in memory of a former vicar Francis Asphitel. 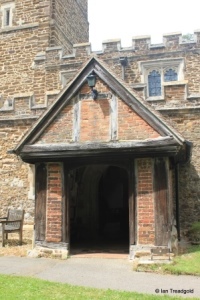 The south porch was erected around 1500 and is timber framed with brick infilling and has no windows itself. The south side of the church is embattled throughout but there is no detailing on the parapets to the north. The three south facing clerestory windows are of two cinquefoiled lights under square heads. 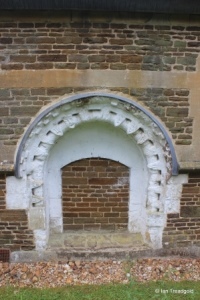 To the west of the porch is a small single light window under a pointed arch. 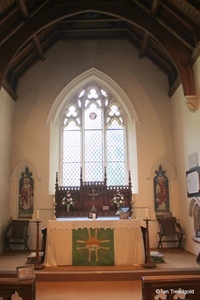 The west window of the aisle is a modern window of two trefoiled lights with a circular quatrefoil design in the plate tracery above under a pointed arch. 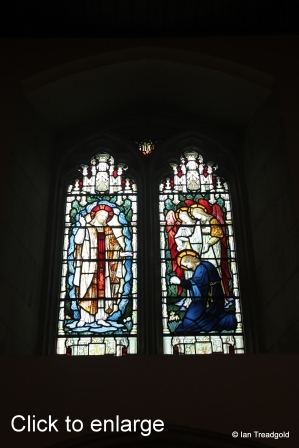 The glass in this window depicts Charity and Faith and was erected in 1886. 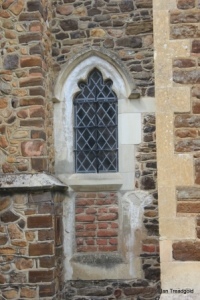 The west end of the aisle has clearly been rebuilt several times with masonry of cobbles with ironstone above and the window inserted into this. The west tower is of three stages with angle buttresses and a protruding internally accessed stair turret in the south-west corner. The belfry lights are of two trefoiled windows under four-centred arches. The west door now provides access to the chapter house. The west window is of two cinquefoiled lights under a four-centred arch. 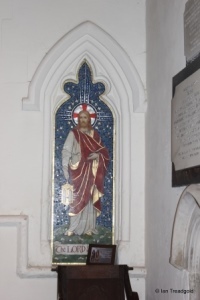 The glass depicts Christ appearing to St Peter and was erected in 1907 as a memorial to John Hatfield Brooks of Flitwick Manor whose initials appear in the bottom of the left hand pane. The north aisle and north side of the clerestory date from the Victorian works around 1857. 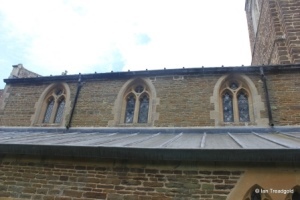 The three two-light windows in the clerestory also date from this period. The building of the north aisle necessitated the movement of the Norman north doorway from the north wall of the church to the new aisle. Being modern, all of the windows date from the Victorian period. 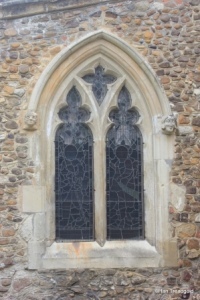 There is a two-light window to the west, two windows surround the north doorway; one of two lights and one of three. 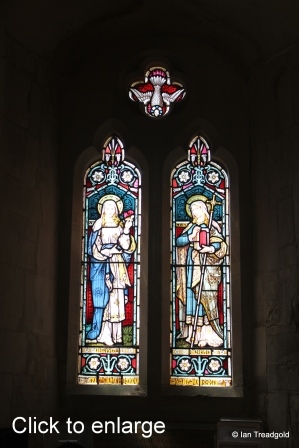 The east window of the aisle is also of two-lights. 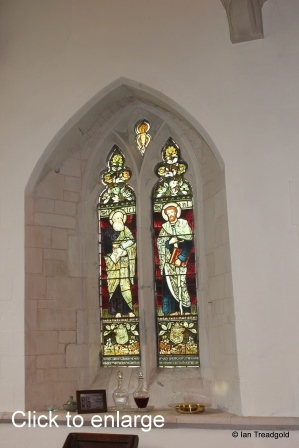 The vestry occupies most of the north side of the chancel but there is a single cinquefoiled window under a two-centred modern window. The glass in this depicts the Virgin Mary with the infant Christ in her arms. 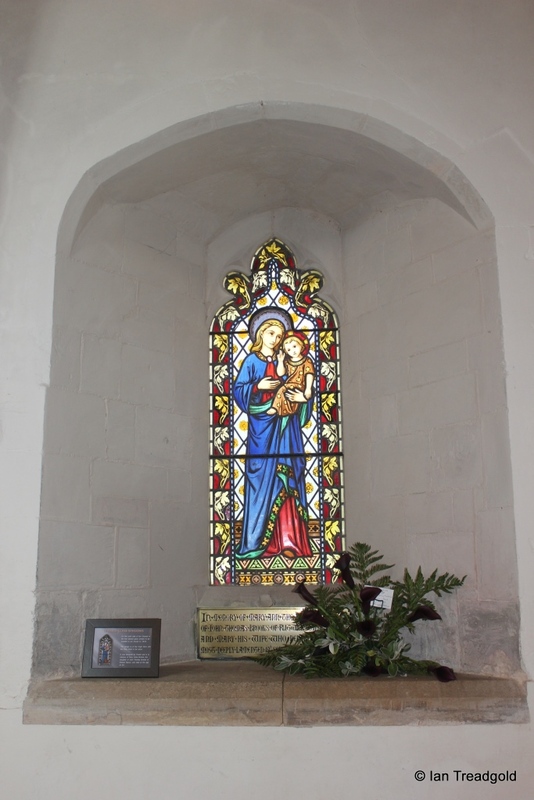 It was erected in 1848 in memory of Mary Ann Brooks the daughter of John Thomas Brooks of Flitwick manor. 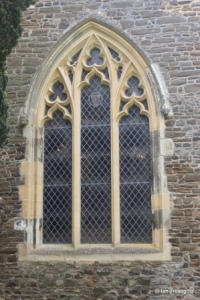 The modern east window is of three trefoiled lights under a pointed arch with geometric tracery above. 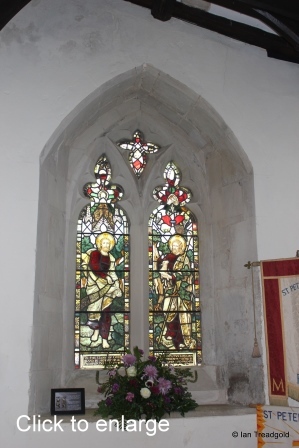 The restorations of C19 necessitated the replacement of the glass with the clear glass now in place. The small round coat of arms is formed of small fragments of medieval glass and depicts the arms of Sir David of Flitwick, one of three knights of this name between 1248 and 1308. 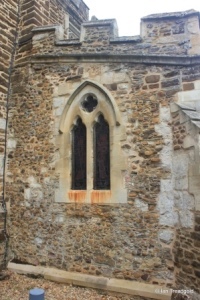 The south side of the chancel has two windows surrounding the extension that is the organ niche. The eastern window is two cinquefoiled lights under a pointed arch. 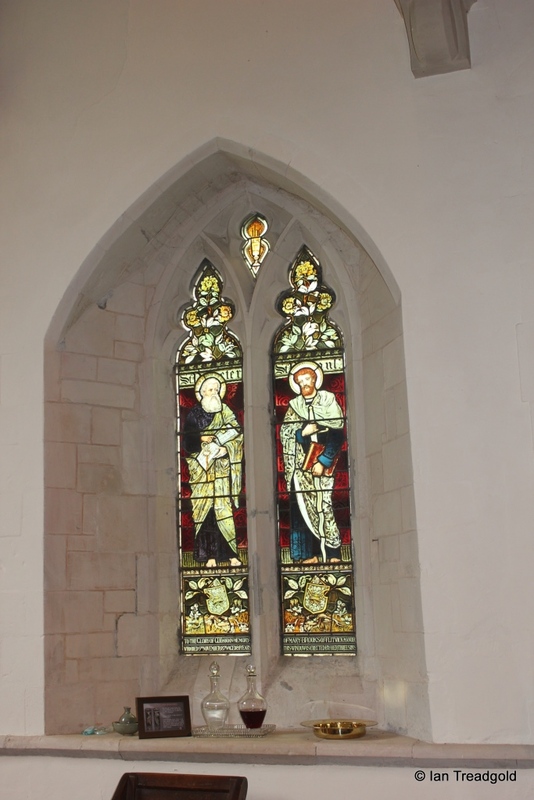 The glass in this window depicts the patrons of the church, St Peter and St Paul. 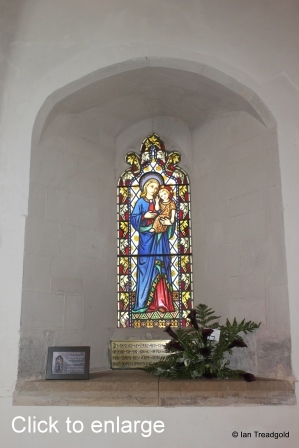 It was erected in the memory of Mary Brooks of Flitwick Manor who died in 1879 aged 84. 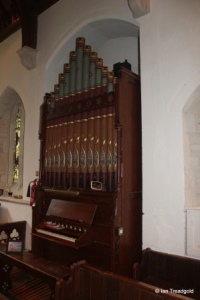 To the west of the organ niche is a single cinquefoiled light split into two by a transom. The bottom portion is now blocked and may have served as a leper’s window opening as like a door. The south aisle had an altar at one time as indicated by the piscina in the south wall. 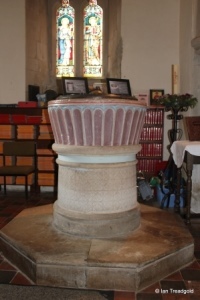 The font has a round fluted bowl of late C12 origin which rests on a modern base. 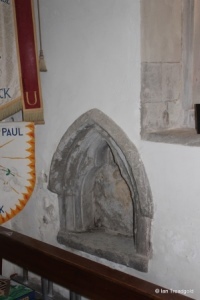 The chancel altar also has a piscina in the south wall. 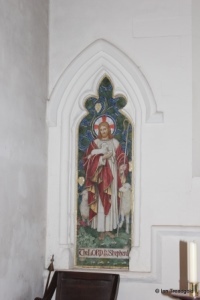 The two mosaics on either side of the altar are modern and depict Christ as the Good Shepherd and the Light of the World.